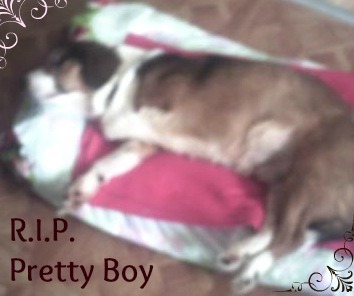 My name is Brandy and I’d like to share my story about my precious dog, Pretty Boy with you. 17 years ago my husband and I went to our local animal shelter and that's where I found my Pretty Boy. A lil Beagle! Pretty Boy (he had the look...) is the way I call him. He has developed loss of kidney retention. But, he never acted like he was hurting. Yesterday, 3-10-2014 I called the Vet. And made an appointment. The Vet said he found masses in his kidney and liver area. He said it was time to let him go... That it was the best thing for him. The only thing I could do was holding him and cry. And, when they stuck the needle in, my words to him were "I’m sorry, please forgive me ..."
I feel so guilty , I hope he knows I love him ...and why I’m feeling this ...He will always live in my mind, always be in my prayers. Needless to say, I had to make the same heart wrenching decision you did. Read the story about the Rainbow Bridge and maybe you can get some comfort from that. I know you miss your sweet "Pretty Boy" but he's playing with our lady on the other side! Condolence's from someone who understands! You will miss Pretty Boy for sure but you have wonderful memories. And yes, Pretty Boy knows you love him and that you were doing what's best for him... I truly believe that.